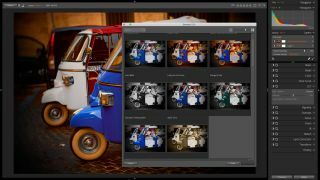 Alien Skin Exposure X4 is one of our favourite Photoshop alternatives, offering all-in-one photo browsing, non-destructive editing and effects. It’s especially appealing to fans of old-school film and analog effects, with a large library of preset ‘looks’. This new Exposure X4.5 update extends its creative scope by adding support for LUTs. LUT stands for ‘lookup table’. This is a kind of digital filter that ‘remaps’ existing colours and tones on to new values. LUTs are very popular in video and cinematography for giving movies distinctive and atmospheric looks, and they’ve recently been discovered by the photographic community too. Alien Skin is offering a small selection of sample LUTs with Exposure X4.5, but you can download and install free LUTs and commercial LUTs packages online from specialists like Lutify.me. They’re added via a new LUTs panel, which also has an option for browsing these different LUT effects visually. Other new features in Exposure X4.5 include a redesigned Copy Photos from Card function with offers a thumbnail image display for easier image selection, configurable keyboard shortcuts and new movable ‘light leak’ overlays including Lens Flare and Haze effects for adding atmosphere to your pictures. Alien Skin Exposure X4.5 can create beautiful and atmospheric images, and the latest version has new Lens Flare and Haze effects. Exposure 4.5 is designed to simulate classic films and processing techniques, and it offers huge scope for fans of black and white. Alien Skin Exposure X4.5 can browse your image folders to help you organise your photos, but also offers ‘virtual’ Collections (albums) for bringing related photos together without physically having to move them. The metadata panel in the new version now shows which Collections any given photo has been added to, and support has been added for a number of new camera raw formats, plus new lens correction profiles. Exposure X4.5’s adjustments are all non-destructive, so you can go back and change them at any time. You can also create ‘Virtual Copies’ to try out different looks without having to create new files. If you already use Lightroom and Photoshop, Exposure X4.5 will fit in fine. As well as working as a standalone program, it works as a plug-in for these programs too, so you can get all its creative effects without having to change your basic workflow. Exposure X4.5 is available now and is a free update for existing Exposure X4 owners. It costs $79 (about £60) if you’re upgrading from an earlier version, while the price for new users is $119 (£91). There’s also a full-featured 30-day trial version if you’d like to try it out first. Alien Skin Exposure X4.5's color toning tools in action.